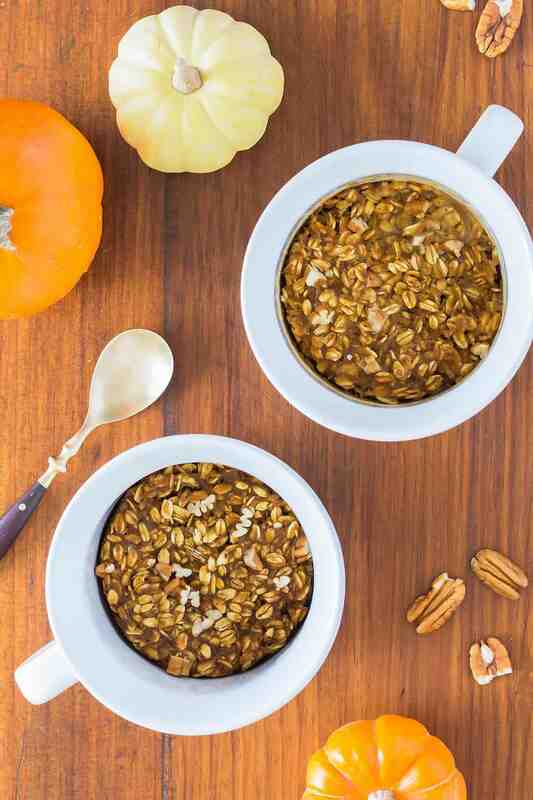 Pumpkin Baked Oatmeal for One is a delicious, yet healthy breakfast option. 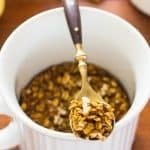 This vegan baked oatmeal recipe is gluten free, clean eating and can also be made in the microwave in under 5 minutes. This post is brought to you in partnership with CorningWare. Their awesome oversized Meal Mugs are perfect for this filling oatmeal for one. Considering my intense love for healthy oatmeal recipes, you maybe be surprised to hear that – until a couple of weeks ago – I never had baked oatmeal. In fact, this is the first baked oatmeal recipe on this blog. Let me assure you though, now that I’ve had the pleasure to try baked oats, I may never go back to eating oatmeal any other way. And there will definitely be more than one healthy baked oatmeal recipe making an appearance here. What does Baked Oatmeal Taste Like? To me, it is like a perfect combination of my favorite oatmeal recipes. The center of this baked pumpkin oatmeal has a hearty, chewy texture, similar to my pumpkin overnight oatmeal, while the top and edges have more of a crispy crunch (reminding me of pumpkin granola). I absolutely love it and so does my toddler Olivia. Granola is just too hard and crunchy for her (still no sign of her 2-year molars) and I can’t get her to eat cooked oatmeal or even overnight oats, but she inhaled this baked pumpkin pie oatmeal! I think it reminds her of an oatmeal mug cookie that we sometimes make together. Indeed, this oatmeal bake recipe produces a texture that is not far from that of a soft oatmeal cookie. While most oatmeal casserole recipes call for the oats to be combined with a mixture of eggs, milk and sweetener, I wanted mine to be baked oatmeal for one. And using less than one egg in a recipe is always a hassle. Of course, I can store the remainder for the next time I make scrambled eggs. However, experience has taught me that I’ll forget about this container of partial egg sitting in my fridge until it has long gone bad. So I’ve developed and tweaked my pumpkin baked oatmeal recipe to be egg free. I made sure to use almond milk in order to be able to add it to my vegan pumpkin recipes. My recipe for baked oatmeal actually starts out very similar to my earlier mentioned pumpkin pie overnight oatmeal. The main differences are less milk and more pumpkin puree. After mixing everything together, it is as easy as popping it in the oven until set – which takes about 20-30 minutes. But there is also another method to make super quick and easy baked oatmeal in the microwave. This is where the awesome Meal Mugs from CorningWare come in super handy! They are big enough to work as mixing bowls for our single serving baked oatmeal. 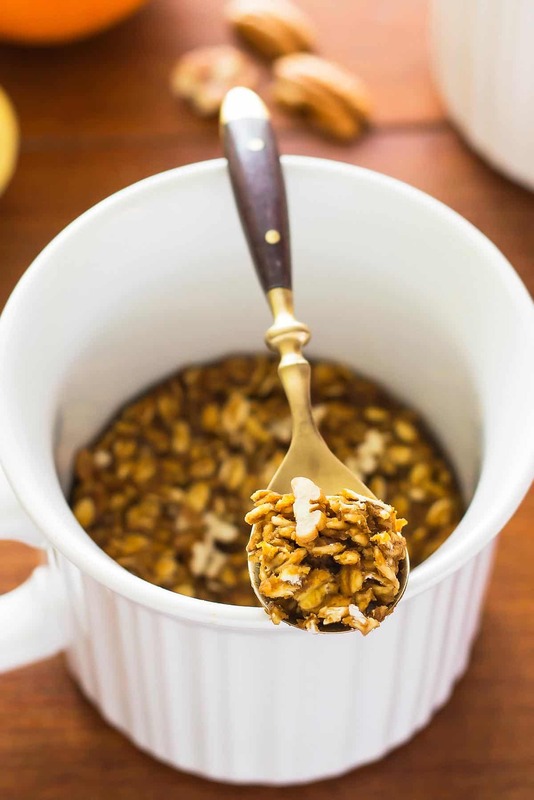 But they are also perfect as a cooking and serving dish, because they are made of durable stoneware material that is microwave safe (and dishwasher, refrigerator, freezer & pre-heated oven safe – so you can also use them for actual oven baked oatmeal in a mug). What I appreciate the most though is the fact that CorningWare’s Meal Mugs have lids!! Suddenly, having pumpkin baked oatmeal TO GO becomes a feasible possibility. 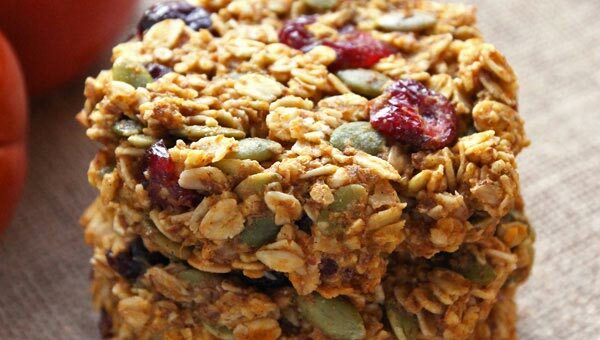 You’ll need to spend just 5 minutes in the morning whipping up and ‘baking’ this healthy oatmeal bake in the microwave. Then, pop on the lid and you are ready to go & enjoy a hot baked oatmeal breakfast during your commute. 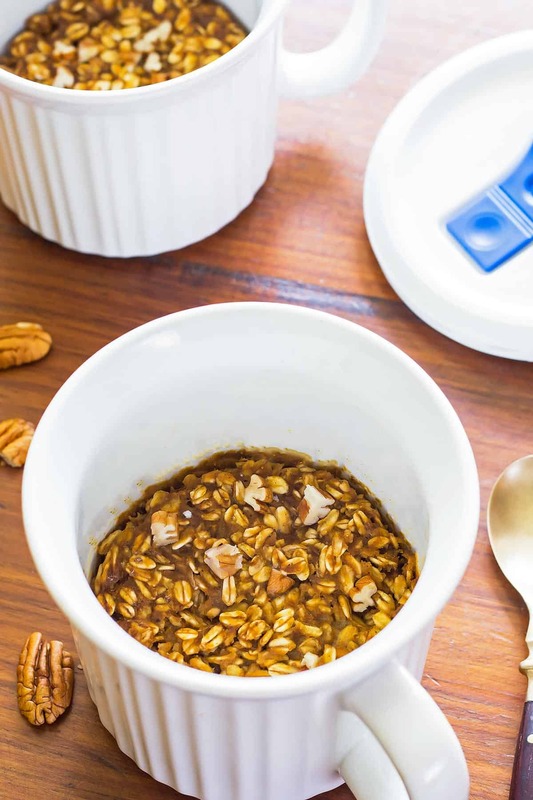 To save even more time in the morning, make a pumpkin pie overnight-oatmeal and baked oatmeal-to-go recipe combination. 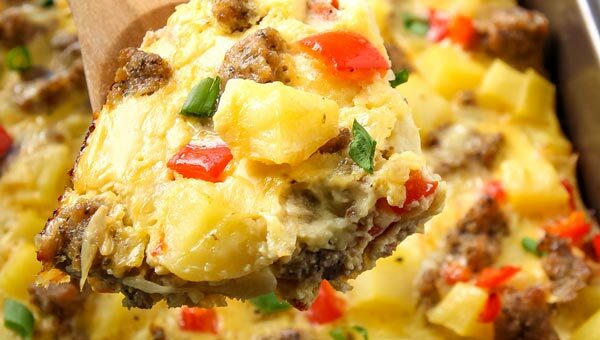 Stir all ingredients together in the mug the night before, cover with the lid and refrigerate. In the morning just ‘microwave-bake’ at home or even at your office. And there is also a chance to WIN these meal mugs! They are just one of the awesome prizes given away during a Twitter party on December 15th. Find more details and RSVP right HERE. Yes, you can definitely freeze baked oatmeal! Especially, because this is an eggless baked oatmeal recipe, you won’t have any texture issues that can happen with some frozen and thawed egg recipes. I doubt you’ll have any leftovers to freeze from this single serving recipe. But if you want ‘make ahead’ baked oatmeal, bake/microwave (one or more servings) as directed, and let cool before covering (yes, the lids are freezer safe too) and freezing. When you are ready to eat your healthy baked oats, take them from the freezer and thaw (can be done overnight in the fridge) and reheat as desired. Pumpkin Baked Oatmeal for One is a delicious and hearty breakfast option, that can also be made in the microwave in less than 5 minutes! This vegan baked oatmeal recipe is also gluten free and clean eating. In a large CorningWare meal mug whisk together pumpkin puree, coconut sugar, pumpkin pie spice, vanilla extract, sea salt and almond milk until smooth and combined. With a small spatula stir in the old fashioned rolled oats until fully coated. Level the pumpkin oatmeal mixture and scrape down the sides of the meal mug with the small spatula to clean them up. 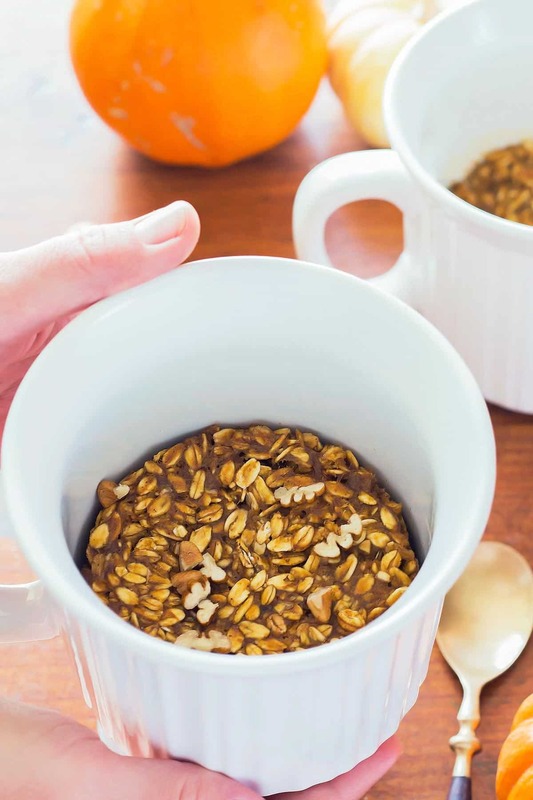 Place the mug with the pumpkin spice oatmeal in an oven that is preheated to 350° F and bake for 25-30 minutes or until the pumpkin oatmeal bake is set - even in the center. Carefully remove the meal mug from the oven and let it cool until safe to touch (it will be very hot straight from the oven). 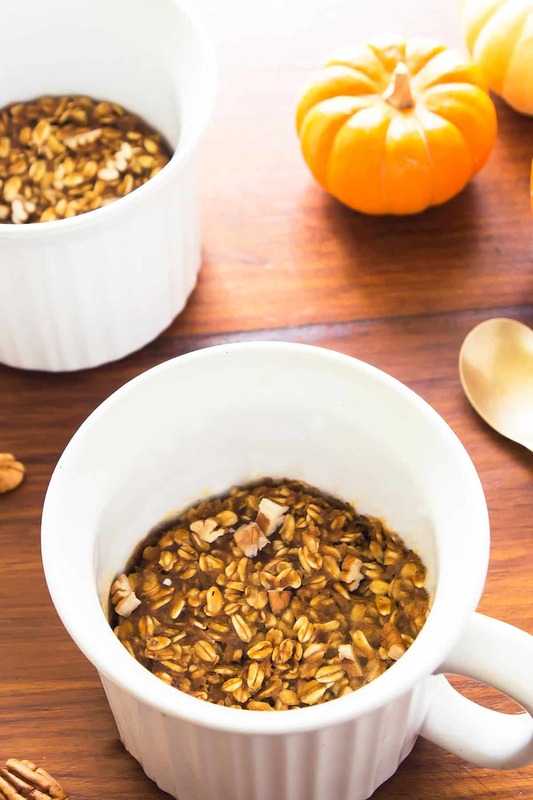 For a quick baked oatmeal, microwave the meal mug with the pumpkin pie oats (without lid) for 3-4 minutes. 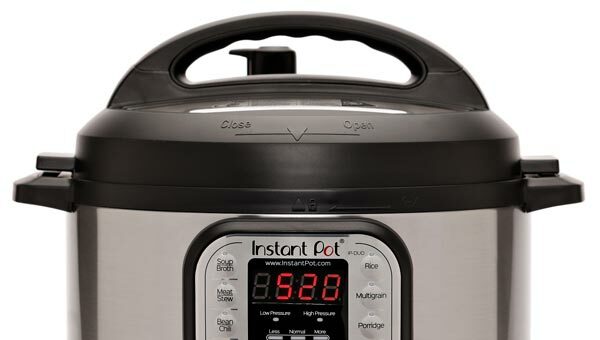 Since microwaves vary in strength, start checking for doneness at around 2.5 minutes and keep adding 30-second intervals until the microwave baked oatmeal is set. Add your favorite toppings from chopped pecans, maple syrup or chocolate chips on top of the baked pumpkin oatmeal, add a little more milk (if desired), and enjoy! Disclosure: This post is sponsored by CorningWare and I have been compensated for my time. Thank you for supporting the brands that make Leelalicious possible. What a gorgeous oatmeal recipe! I can’t get enough pumpkin lately! You make it look so easy! Cute video too! Thanks so much for such a lovely breakfast idea! What a great idea. I love the single size! Thank you Linda. What’s not to love about eating from a mug, right? 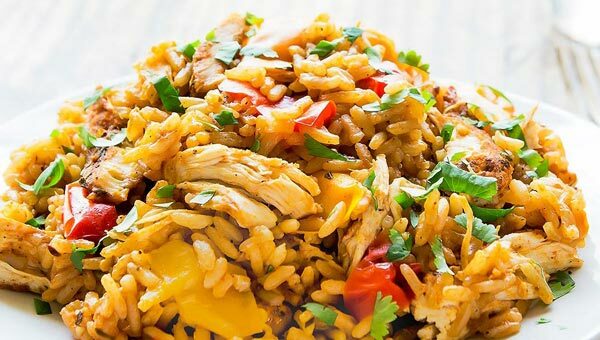 This looks so easy, not to mention delicious! I love your video!